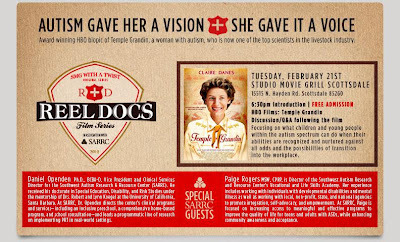 Studio Movie Grill, in conjunction with SARRC, invites families and friends to an evening screening of "Temple Grandin" at 6:30 p.m. on Tuesday, February 21. This event will be FREE of charge for all individuals who are interested in attending. Following the screening there will be a Q&A discussion facilitated by SARRC's Vice President and Director of Clinical Services, Dr. Daniel Openden, and SARRC's Director of the Vocational and Life Skills Academy , Paige Rogers. The conversation will focus on identifying and nurturing the talents of children and young people with autism, and learning ways help them transition into the workforce. Please remember that seating is limited to the first 200 registrants! 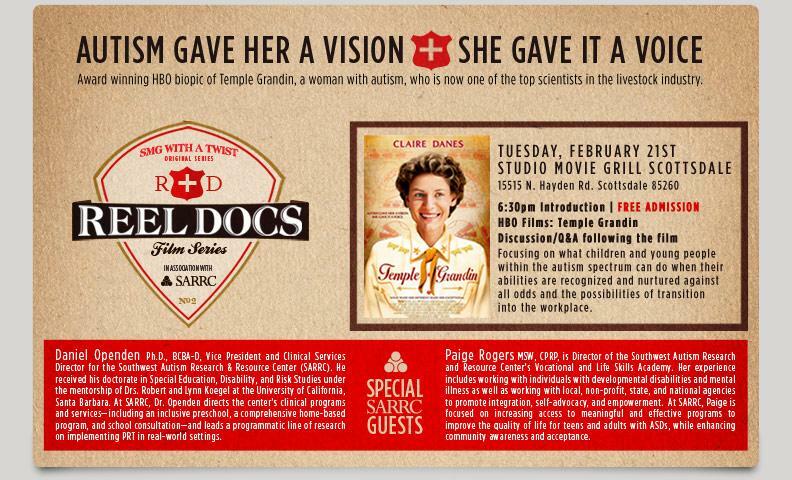 1) Email your name and the number of people in your party to sarrc@studiomoviegrill.com. 2) When you arrive on Tuesday evening, simply mention to the box office staff that your family is part of the SARRC promotional screening.